Happy Friday! This week's blog post is a sort of supplement to my weekly YouTube video. 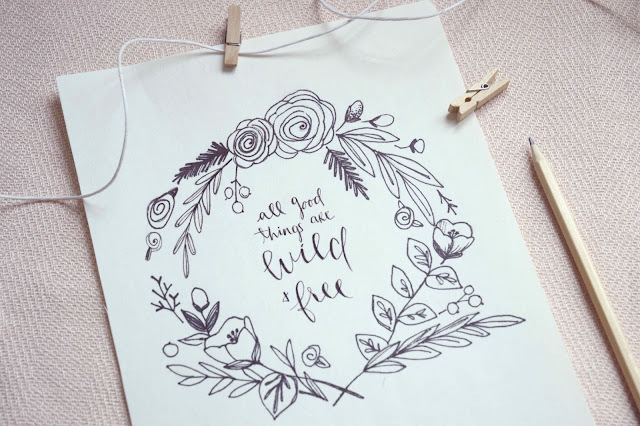 In my latest tutorial I talk about how to illustrate flowers, how to place flowers on the page to form a wreath, and how to add a quote to your project. At ten minutes, the video is pretty short (at least by my long winded standards); I go through illustration and design layout, and then I finish my whole project with a black artist's pen. And that looks great. 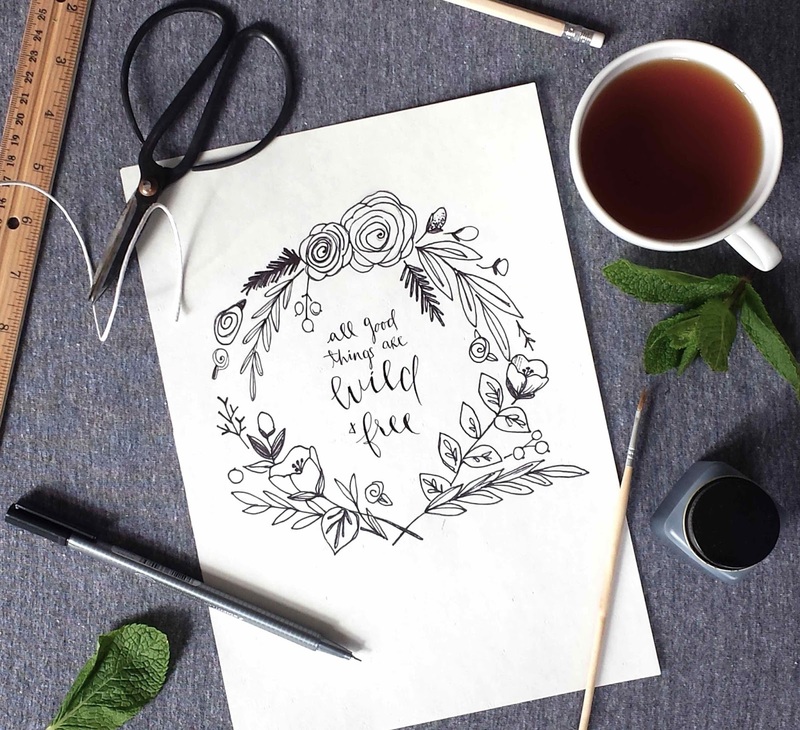 You can do a lot with your Sharpies and artist's pens, especially if you're thinking about uploading your design and turning it into clip art. But there are so many more exciting mediums out there, and floral design lends itself to pretty much every single one! So in this post you'll find some more information and a few more photo examples that I hope will inspire you. This simple leaf wreath is a mixed media piece. 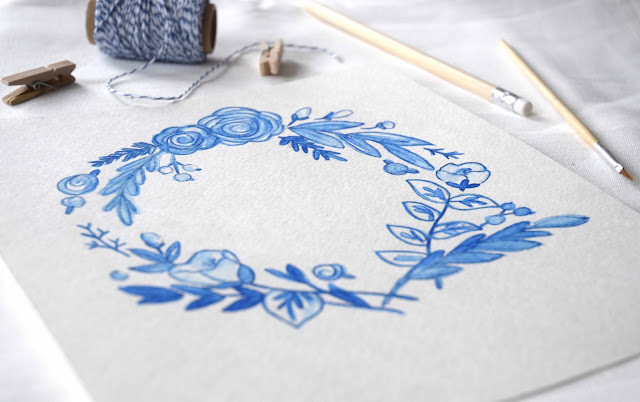 I began by sketching out my wreath; then when I was happy with the design I transferred it on to a nice sheet of 140 lb cold pressed watercolour paper. I painted the leaves and branches using watercolour paints, and I finished the illustration with my black artist's pen (Staedtler Triplus Fineliner). For my tutorial on mixed media illustration, click here, and you'll get there! This wreath is the same design that I used in the video. But instead of using pen to finish it, I transferred my design onto watercolour paper and traced over my contour drawing with a blue watercolour pencil crayon. Then I took a glass of clean water and a small (no. 4) paintbrush and worked with the design, adding water to turn pencil crayon into paint. The key to watercolour pencil crayon is to shade some areas very heavily and other areas quite lightly so that when you add the water you maintain some contrast. If you're new to watercolour pencils, you may find my video helpful! Having trouble choosing a quote to work with? Try looking up the words and lyrics of your favourite musicians, philosophers and poets. 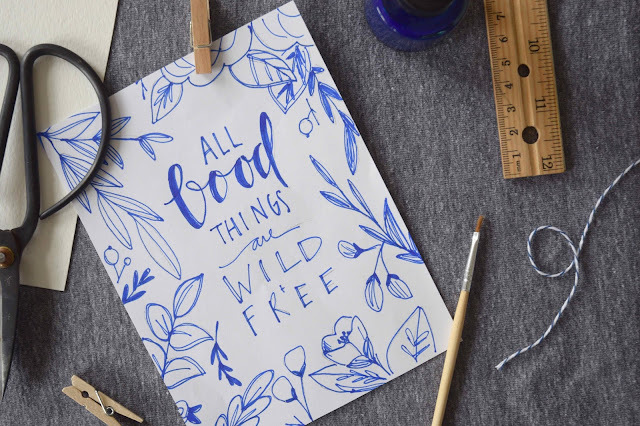 Here I've worked with some Thoreau quotes and they're much more meaningful to me than anything that I would have found on Pinterest. In the video tutorial I show you how to produce a piece like this. To prepare this you only need one pen. It's that simple! I think black, blue and grey ink look best, but you could experiment with all sorts of colours. I also think it would also be nice to finish this project using a small paint brush and some india ink. If anyone tries that, please post on my FB page! 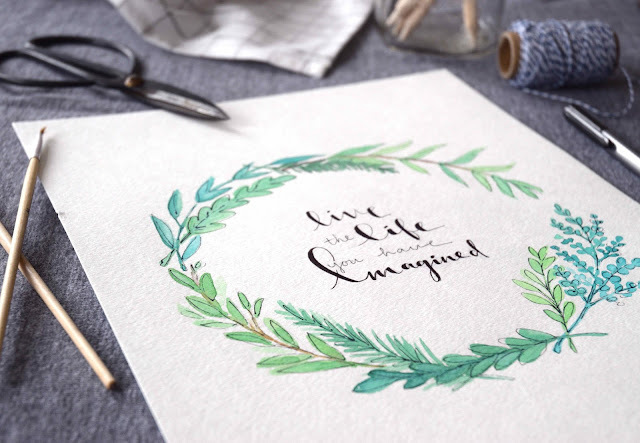 Here's another design method to try; place your quote at the centre of your paper and draw leaves, flowers and vines all sort of shooting in from the outer edges of the page. 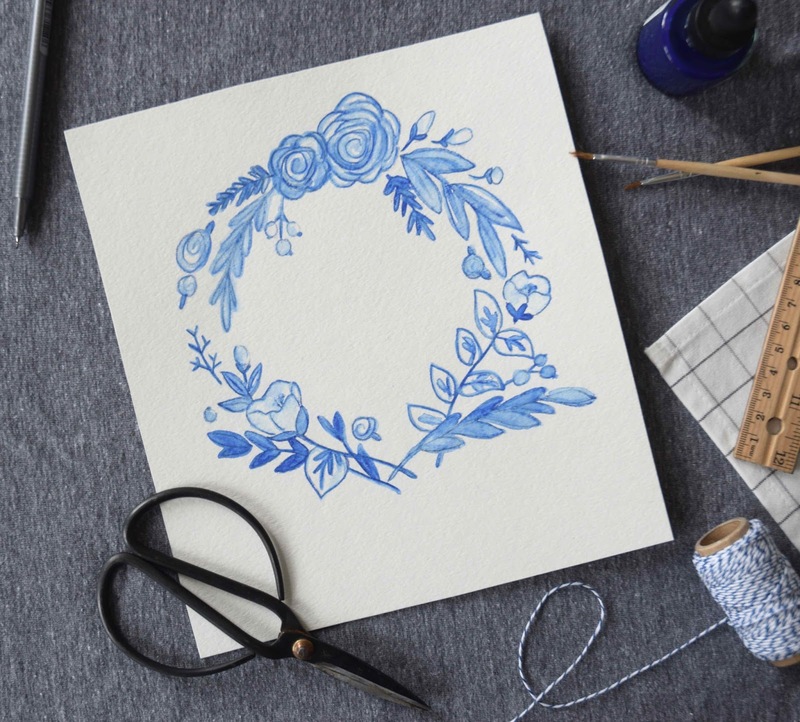 This is even easier than illustrating an entire wreath and it looks super pretty! 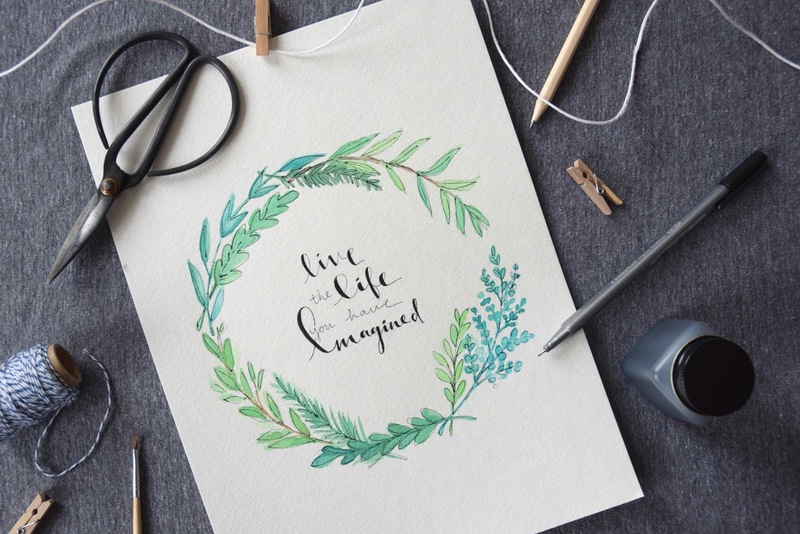 Good luck with your illustration and lettering! Please find me on social media and share your work with me! Thank you very much! This video helped me soooo much. I was wanting to put a wreath in my new bullet journal and had practiced a bit without being in love with my efforts. With your help, now I'll have a beautiful one! I subscribed to you on YouTube last night and then came over to look at your blog this morning. It's fantastic! I have so much catching up to do! You are very professional and appealing in all the aspects of your videos and blog site. It will be fun to watch it grow! And I, for one, would love to see more of Iceland while you're there. You must have some ancestry from around that area with your beautiful hair, am I right? Hello, thank you for the link. There are tons of flower and leaf shapes to use! I really like your tutorials, I actually discover them on youtube. I have a question you may already have already answered, if so please apologize me. The watercolors (I refer to the palette) you use are very nice (they seem very creamy) what is the brand? Annie G, in her hand lettering tutorial she said the brand was Artist's Loft. It's the store brand from a craft store called Michael's. If you are looking for most excellent Best Status for Whatsapp or Facebook then have a look at this amazing collection. This one line status collection is absolutely unique and cool.